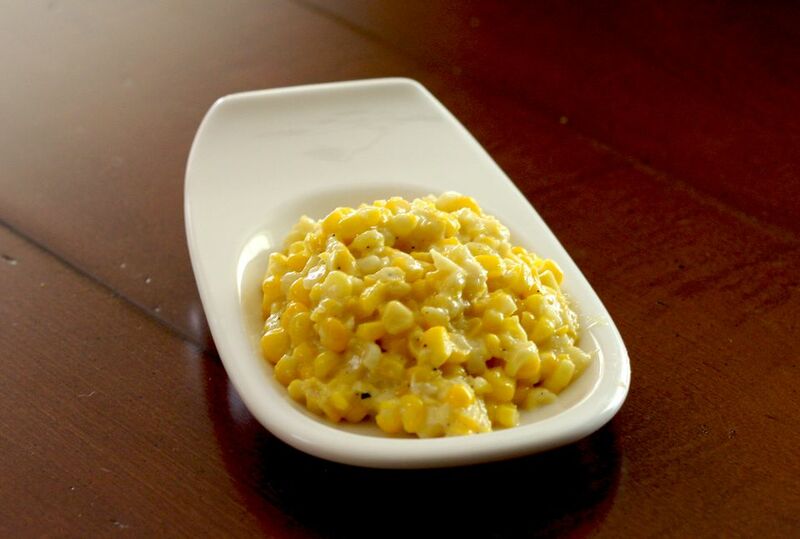 This delicious, sweet cream-style corn is a recipe your family will ask for again and again. This is a great side dish to serve along with an everyday meal or when you want to impress, and it's super easy to prepare. Corn from your local farmer's market or, better yet, your backyard garden, will be super sweet. Even if you can't get the freshest ears of corn, this dish will not disappoint. Using a sharp knife, cut the tip off of the corn. Place on a large plate or wax paper, cut side down, and cut the kernels off of the cob, following the angle of the cob with your knife. With the dull side of the knife, scrape the cob to get any extra juices. Repeat with the remaining cobs. Combine the corn and juices with the cream, salt, pepper, and sugar. In a medium skillet or saute pan over medium-low heat, melt the butter. Add the corn and reduce heat to low. Cook, stirring frequently, for 15 to 20 minutes. Combine the cold water with the flour until well blended. Stir into the corn mixture and continue cooking and stirring until thickened and bubbly.